Glampers and pets at this pet-friendly villa will take a step back in time at this glamping property. The hosts did all they could to conserve the interior and the furniture has been placed and used to decorate in a beautiful and simple way that continues the form and function of the original building. Given the irregular surfaces, if free standing furniture were introduced, it would be unstable and feel out of context. The objective was to make the minimum intervention to the interior, letting the cave interior express itself – so lights were hidden. Where needed, and with reference to the lives once lived in these caves, recycled materials are used to build furniture (cupboards, chairs, desks). The goal was that the simplicity of form, in tandem with the structure, would not interrupt the dramatic setting of the Sassi. The changes aim to form a dialogue with the cityscape and its history. While at this pet-friendly property, glampers can book one or more of these exclusive itineraries, arranged specifically for them by the best guides in town. 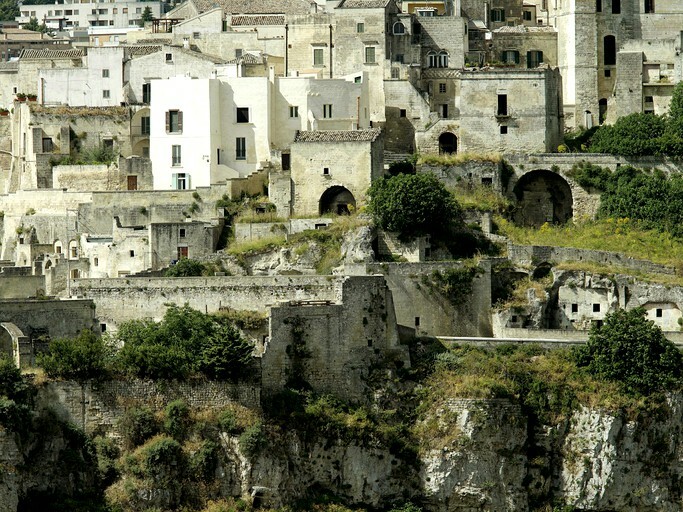 A guided tour of the Sassi of Matera. 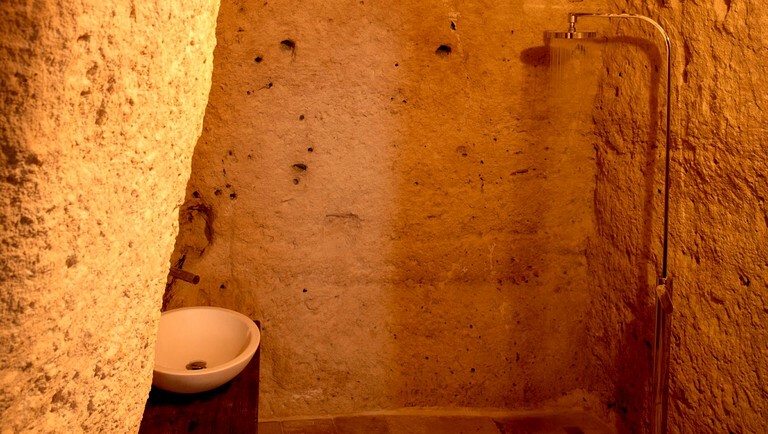 Visiting the Sassi of Matera means having an out-of-time journey through the traces of the uninterrupted presence of the man in this area, from the Paleolithic to the present days. 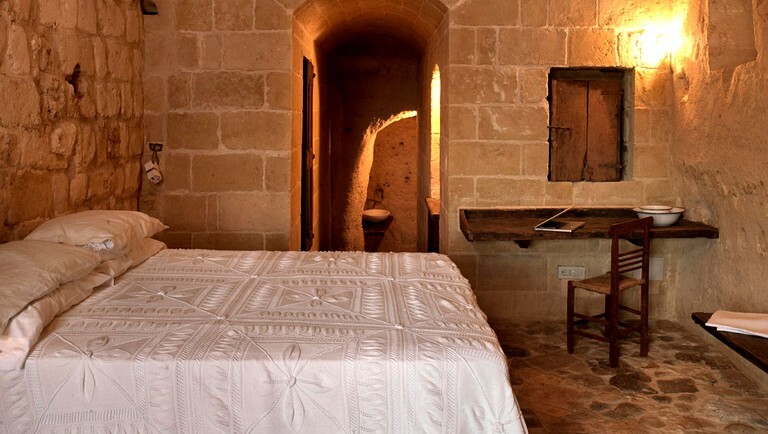 These are suggested itineraries for Matera Trekking on the Murgia. 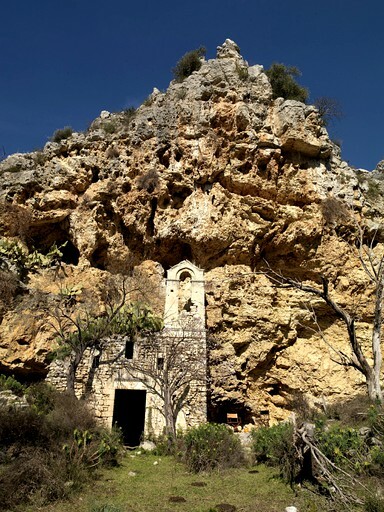 Madonna degli Angeli, visiting the Sassi of Matera and the Archaeological Park of Natural Rock Hewn Churches means getting lost in the paths of an ancient and rocky landscape of huge charm. 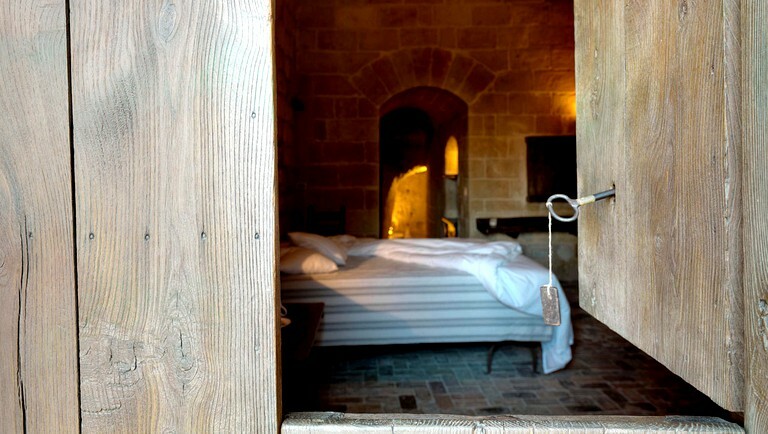 The historian Leantro Alberti who visited Matera in 1550 wrote that the Sassi at night had “a good likeness of the clear serene sky embellished with clear and shining stars”. The visit of Sassi at night still has this unique charm. Departure at 7.00 am with a visit of a typical bakery and tasting of some local products (the Matera’s bread, the focaccia, biscuits). 8.00 am: transfer to the “caseificio” and view the making of mozzarella by hand and the “caciocavallo” cheese workshop. A guided cycling tour departing from the Sassi, the Baroque town and some of the new Matera districts (where the Sassi inhabitants transferred in the fifties). Length: 3 hours. Included: hybrid bike rental and tourist guide. Visit to Montescaglioso, home to the region’s most important Benedictine monastery, and Miglionico, a small medieval town home to Castello del Malconsiglio. Visit to archaeological digs in Metaponto, an ancient colony of Magna Grecia. The sacred area, theatre and potters’ district are still clearly visible. Tavole Palatine, a splendid temple from the 6th century BC dedicated to Hera is not too far away. Trip to the enchanting lunar landscape in the more undiscovered Basilicata. Stop off in the abandoned village of Craco, the Rabatana in Tursi, a 5th century village, and the Anglona Sanctuary, with its medieval frescoes. Length: max 6 hours. Transfer included, entrance fees excluded. Transfer to Venosa (60 min. ), birthplace of the Latin poet Horatio (Carpe Diem). Visit the Archaeological Park, the “Abbazia della Trinità” and the “Incompiuta”. Visit a typical vineyard with tasting of Aglianico (the local red wine), olive oil and the typical cheese of the Vulture area. Length: max 5 hours. Transfer and wine tasting included. A unique piece of medieval military architecture, Castel del Monte is a successful blend of elements from classical antiquity, the Islamic Orient and North European Cistercian Gothic. This was completed by Friederick II in the 13th century and was elected UNESCO Heritage Site in 1996. Length: max 4 hours. Transfer included, entrance fees excluded. Journey to Pietrapertosa (90 min. ), in the Park of Gallipoli Cognato and the Lucanian Dolomites. Head towards the Saracen fortress, almost entirely carved out of rock, which offers a marvelous panoramic view of the Basento valley. All the bookings are charged on a double occupancy basis with a baby's cot free of charge in each category.